WE HAVE COME A LONG WAY in the central Iowa metro housing market from the standard two-story so-called “Des Moines plan.” And, in the last decade, where much of the news has been about the housing recession around the country, a subtle trend to a more casual lifestyle has evolved. The way people live, work, and play in their homes has changed over the years. Because of more casual living, formal dining rooms aren’t so necessary anymore for many families. There’s also the heightened importance of the back entry, where cubbies are becoming standard for kids to drop their backpacks and sports equipment when they come in from the garage. And storage, storage, storage has become the mantra of busy parents. Is the metro adapting to those national trends for builders and remodelers to follow? 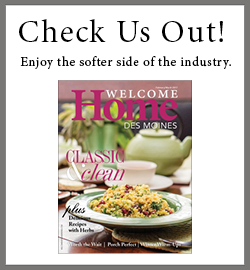 For the answers, BUILD Des Moines talked with an architect and three building designers, all of whom work with homeowners, home builders, and remodelers in creating new homes and transforming older ones. If they could stand at the podium in front of builders and remodelers, what would they cite as the newest trends and features? Amy Larsen of Beisser Lumber Company in Grimes would note, “I work with more and more clients who want ranch-style homes. They’re looking ahead to a time when they can ‘age in place,’ and ranches are more conducive to that. However, those families with several children usually still choose a two-story design.” In that vein, more homeowners are opting for the getaway feel of having the master suite on one side of the home and children’s rooms or guest rooms on the opposite side. Walk-out situations work well for that purpose, too. Multiuse spaces are also key for many homeowners, and casual offices in rooms that can go up to the plate for other uses also are on the wish list. In our area, the whole concept of outdoor living has had a huge impact on home design. A covered porch or deck with a sitting area is so important to many homeowners, and that area expands with the addition of fire pits, outdoor kitchens, and even sand volleyball courts. Many homeowners don’t want a formal dining room, but that doesn’t mean the space for one is gone. Families still want a space for a big table that can seat 12 or 14 people when they need to, but it might mean a larger kitchen area. As for kitchens, many people want a chef’s kitchen with multiple work stations, and they want interesting countertops in concrete, quartz, or granite. In many bathrooms, the tub isn’t always included as larger walk-in showers take precedence. We let the homeowners dictate. We recently designed a 100-square-foot shower. The master bath has become more spalike. Homes must deal with more multigenerational spaces these days. It’s not just mother-in-law suites but also spaces for college kids returning home or visiting families with young children. Homeowners want everyone to have a space. And with an aging population, where considerations of snoring or health issues must be dealt with, we actually have designed split master suites: master king and master queen spaces. When it comes to building spec homes, builders need to consider upgrading a few special features to give them a custom touch—a nice fireplace surround, good countertops, or special storage areas. A covered deck or a sunroom is an absolute must these days. That whole area has expanded in the last few years. While it depends on the client, of course, I agree that the formal dining room is not a must-have, but the space for it is. Millennials—generally those born after 1982—like the space but just use it differently, such as an office or craft room. Another trend is having the laundry room attached to the master suite. The finished lower level also becomes bedrooms or hobby space. Plus, the walk-in shower is becoming standard, and if the clients want a tub, it’s a free-standing soaking tub rather than a built-in one. Even spec homes often have plans for a future finish of the lower level. One overriding trend is the minimal, no-clutter look. People are so tired of the cookie cutter look. The open concept is here to stay. Clients want rooms to open onto each other. We’re seeing more ranch-style homes, but larger families still prefer two-story plans. Also, they want more contemporary looking exteriors, with lower-pitched roofs and sleek window openings. Kitchenwise, clients want the space to be multiuse so that a large eat-in area can hold a large table for projects. Walk-in pantries are must-haves for many homeowners. Some are big enough to hold freezers and lots of appliances. They almost become prep kitchens off the main kitchen. Many people are planning ahead and want to stay in their homes longer, so “aging in place” or accessible considerations are important. For spec homes, I feel it’s important to offer as much storage and built-in features as you can. Some builders are becoming known for their attention to those points, and it helps that buyers can latch on to those details. An attractive mudroom area off the garage entry into the home is strong with many clients, and covered decks or sunrooms are still strong around here. The dining room is pretty but doesn’t get much use in most households, so the space becomes a home office usually. With kitchens, the island is a priority in an open area, as is a pantry, whether it’s part of the cabinetry or a walk-in style. It’s all about extra storage. The grand shower in the master bath keeps getting larger. And, if the clients want a tub at all, it’s a free-standing soaking style. I find that clients know so much more these days about the products available to them. We used to have to explain certain details to them, but now clients already know about them. Spacewise, there’s a mix. Some people really want the square footage, while others want to make the most of more efficient spaces. Also, homeowners put so much more detail into the exterior or curb appeal of their homes. Again, they just know much more about what they want.